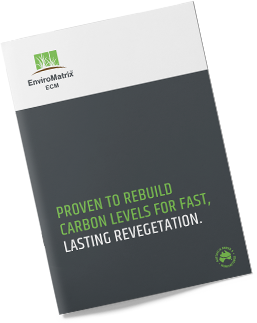 Why Does EnviroMatrix ECM Work So Well? 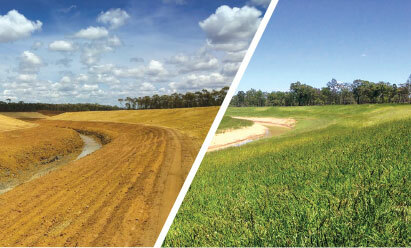 Our perfectly balanced revegetation formula includes organic fibres, a volcanic mineral + TE-based fertiliser, a diverse range of beneficial bacteria and fungi, soil conditioners for building humus/carbon, and bio-compatible glues that bind mulch and soil particles together. A vital part of the mix is a suite of 22 microbes. These microbes assist in creating a healthy ‘rhizosphere’ around the plant root, and in sourcing various mineral nutrients from the Troforte program revegetation fertiliser. essential ingredients that would ‘wake up’ unresponsive soil. Azotobacter Free-living nitrogen fixers to convert atmospheric nitrogen in the soil. Azospirillum Produce plant growth hormones and biologically active substances. Bacilli Produce beneficial metabolites that are useful in plant protection, including lactic acid bacteria to help with soil condition structure. Cellulolytic Fungi Useful in the biodegradation, decomposition and recycling of cellulosic waste (i.e. stubble) into organic carbon. Mycorrhiza (VAM) Important biological components of soil life and soil chemistry. These convert nutrients and actively source phosphorus and other key minerals and harvest water. Phosphorus Solubilizing Bacteria Converts insoluable phosphorus (eg Rock P) into plan available "P". Pseudomonas Able to degrade a broad spectrum of compounds, acting as bio-remediators. Streptomyces Includes Actinobacteria. Helps control pathogenic microorganisms. Saccharomyces Important yeasts that convert carbon dioxide into organic carbon and sugars within the soil. Trichoderma Beneficial fungi that help to minimalise wilting and dampening of seedlings. Now being successfully utilised on a commercial scale for potential biological control of other pathogenic fungi.